a rather unusual chinaman: Union Jacks - "We're not in Italy any more..."
Union Jacks - "We're not in Italy any more..."
Jamie Oliver, love him or hate him the little scamp. Personally, I am stuck right in the middle of this rather complicated equation. I love rustic Italian food with strong clean flavours, and much of the food that Mr Oliver serves at Fifteen (his first solo venture) falls firmly into this category. Jamies Italian, his subsequent chain of Italian restaurants, still hits the spot if all I am craving is a well put together bowl of pasta (ignore the other stuff like the “worlds best olives”. They’re not bad, but definitely not the best and the rest of the menu is lacking). 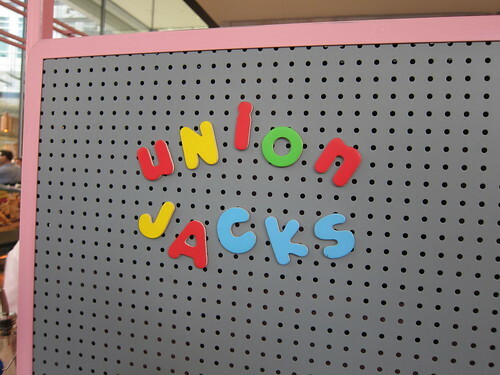 Now we have Union Jacks, which, at the insistence of our server, does NOT serve pizzas but very British flats. This emphasis amused me a lot, but I kind of understand why. The amount of times where I have declared that a pizza was good, only to be castigated by an Italian friend telling me that these pizzas could never be good, as they aren’t real Italian pizzas. Too much sauce, the wrong dough, bad mozzarella, the list goes on. Best to play it safe. Jamies rendition of an English "flat" is definitely not that far removed from the Italian pizza, but tasted pretty good in my eyes. Taking along a few of my colleagues, we managed to give most of the flats a run out. My personal favourite was the Woodman which was essentially a mixture of mushroom, cheddar and herbs. 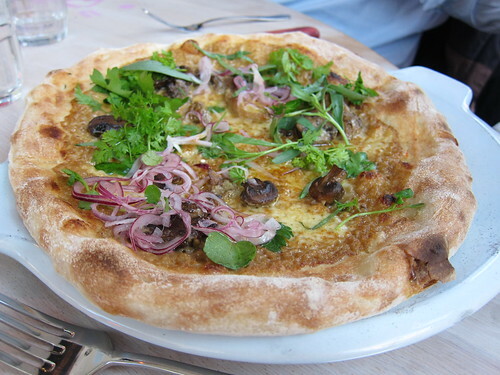 The chervil and tarragon were a nice touch, with hints of licorice cutting through the rich mushrooms and the pickled red onion adding a little pep to the rich earthy flavours. Out of the other flats, the Red Ox (ox tail, brisket, red Leicester) was the surprise hit for colleagues who were a little wary of oxtail (but grew to enjoy the deep beefy flavour), where the Chilli Freak and the Old Spot weren't too bad either. 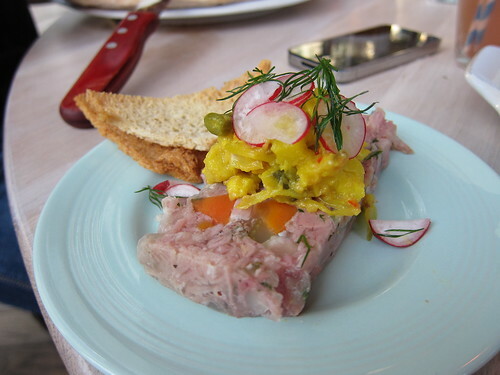 The only real disappointment was the slightly wet ham hock terrine, even though it arrived looking the part. Geographical origin aside, I enjoyed the flats, and although the space is rather large and oddly shaped, there was a nice hum around lunchtime, even if the staff seemed to be rather haphazardly running around and chatting to each other as opposed to tending to their tables. I guess I would be the same if I knew I had to spew the same "these are not pizzas" spiel every time somebody sat down. Even so, embrace the flats and swing by for some tasty treats on dough. Thanks for the review. 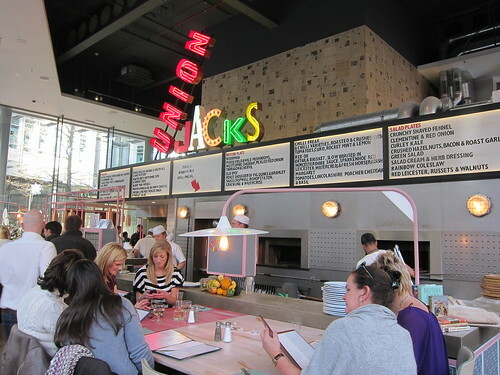 I've been somewhat intrigued and baffled by Union Jacks, since one of the partners in it is Chris Bianco, who runs one of the best pizza places in the US. I would never have expected him to partner up with Jamie Oliver... and never expected him to be helping sell "flats" instead of "pizza". But I'm definitely interested in seeing for myself how this turned out.